It’s time to experience the world of imagination and creativity with the new Pop Oh Ver line. Offering a space saving solution that you wouldn’t typically see out on the market, these are sure to be a parent favorite as well. So what exactly is a Pop Oh Ver? Its an item that goes over a typical kitchen chair and transforms it. Made of durable canvas material, this is lightweight and easy to take from place to place for play anywhere. There are two models out on the line that are currently out. The kitchen stove and the counter top. There are also accessories in the line as well which we will discuss further. The Pop Oh Ver line is manufactured from Kangaroo Manufacturing and is the newest on the scene for their products. Many of you may be familiar with Kangaroo Manufacturing in the past with their other products such as pool floats, party favors, and costumes. This company has been a successful business offering great things in communities and benefits as well. Owner, Justin Ligeri,feels this will be their most successful product line for children. 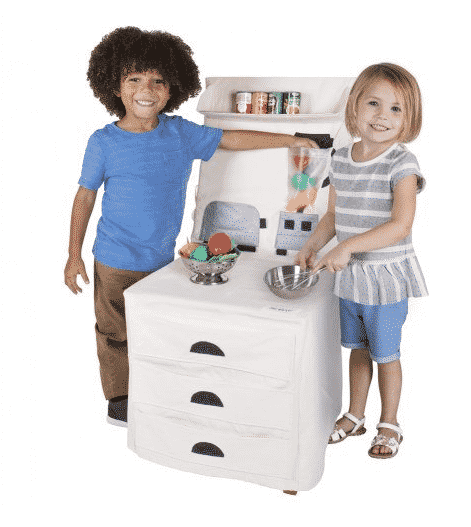 This product line will not only offer the Pop Oh Vers themselves, but it also will offer pretend pots and pans, a chef costume, and much more to come as the items release. As a mother of five children, I am familiar with the amount of space toys can take up. I also know how much of a hassle it can be as well carrying a variety of toys from place to place. When I took a look at these, I took a look at them from a parent’s perspective. The stitching is well done on these items. The ties are reinforced to the Pop Oh Ver well and after tugging on it as if it were a toddler, they held up nicely. There are magnets on this item, so of course you would want to exercise supervision during play. As in terms of an age range for this item, I would say it would be great for kids of any age. It didn’t take my small army long to get various stains on theirs. I put these into a front loader washer on gentle cycle and let them air dry. I had no issues with that and they were not compromised in any sort of manner. Just be sure to take the plastic reinforcements out prior to washing. I would not recommend throwing these in the dryer for obvious reasons. You could of course spot clean these as well with the same success. Just all depends on what you would like to do. 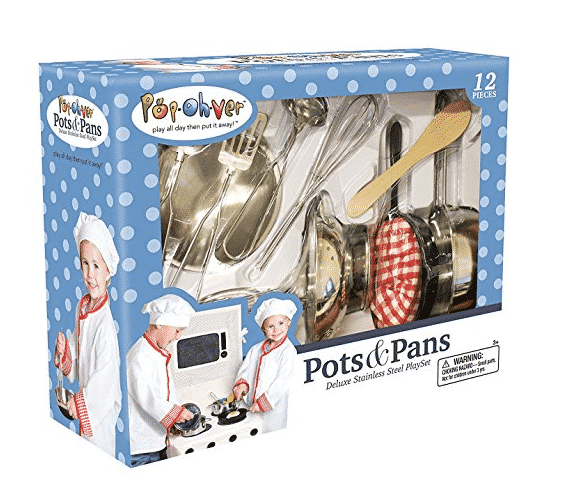 The company also offers a set of play pots and pans as well as play food to compliment the Pop Oh Ver items. There will be stuffed food released within a few months which may be easier for the smaller kids to grab onto. To complete the role, there will also be chef costumes for the kids. They have really thought about everything with this line for the kids. Whether you are an establishment such as a daycare or school, or just a parent, these are sure to be a hit for your little one. Keep your eye out as there will be more released in this line and you will certainly not want to miss out.